Home > Blog > Why Is There Cotton In My Medicine Bottle? Why Is There Cotton In My Medicine Bottle? If you've ever wondered why there's cotton in your medicine bottles, close observation might guide you to the answer. You'll notice that you never get a cotton ball stuffed in your medicine bottle when it's filled by the pharmacist--rather you tend to find them in shipped medicines from online pharmacies and over-the-counter packages from the manufacturer. That's your clue right there. It serves its entire purpose during handling and transport. Since pill bottles aren't filled to the top, the cotton fills in the empty space so the pills don't rattle against each other too harshly and chip and break. Clearly you don't need protective cotton balls if you're just taking your bottle of pills from the pharmacist's counter to your car to your home--unless you're an extremely dangerous driver. It's easier to tell if your pills have been tampered with if they generally come whole, without chipping and breaking. Broken pills lead to an issue of dose control. Taking a broken pill means you're not getting enough of your medication, but trying to add fractions of chipped pills together to make a whole dose is iffy, and could lead to potential overdose. Breaking and chipping destroys the coating on the medicine. This matters for two reasons. First, the coating often allows people to swallow the medication more easily, and covers up a bitter taste. Even more important, the coating might be part of a medication's time-release design. Chipped pills thus may thus not release the dosage as intended, which can lead to a lack of efficacy, or even too much of the medication released at one time. So while the cotton plays a crucial rule in maintaining the safety of your medicine, you might think that cotton is cotton, and that's that--but what would the world of medicine be without some regulative body to establish its parameters? 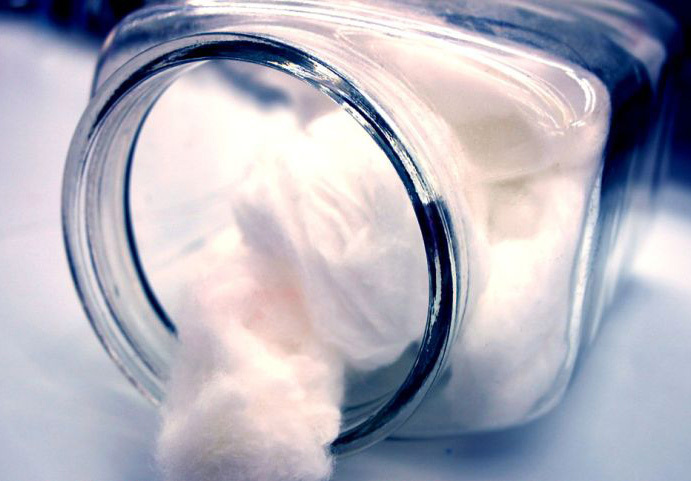 For example, is it really cotton--and how should it be made sanitary enough to put inside a pill bottle? First, your downy plug might be cotton, but, equally likely it's rayon or polyester. Second, an organization called the United States Pharmacopoeia (USP), which has set quality standards for U.S. medicines for nearly 200 years, establishes criteria for that cotton. Not just anything goes. Actually, the USP is a non-governmental public health organization, so your tax money isn't supporting it, but it has an important job, and its standards for medicines are updated regularly. Those standards are published in something called the United States Pharmacopeia "National Formulary" (USP-NF). The USP's decisions are important enough so that once the USP develops a standard, it's enforceable by the Food and Drug Administration, and all drug makers have to follow the standards if they want to market their drugs in the U.S.
Because cotton can attract pathogens and contaminate medication, many drug companies use hydrogen peroxide to sanitize the cotton balls. The USP is in charge of defining the thresholds for the hydrogen peroxide used in the packaging materials. The USP is nothing if not precise about the use of hydrogen peroxidein the cotton. To be exact, "The USP 670 draft states that, in the future, no more than 50 ppm of peroxide will be permissible per gram of cotton fiber: Before measuring, the fibers must be stirred for three minutes in 30 ml distilled water." But your cotton, though thoroughly sanitized, shouldn't remain in your medicine bottle once you've opened it. As opposed to keeping the medicine fresh, it actually attracts moisture, which lowers the medication's potency. The presence of cotton in your medicine bottle does not help them to last longer or keep it any fresher, as some may assume. Most drugs actually have very long expiration dates. If you're at a loss as to what to do with it, know that it's quite useful for removing nail polish. If you're male, or not a nail polish wearer, you can always dust off your computer with it. Now you want to know what to do with those desiccating packets? That's a post for another day. and do you know how difficult it is to pull the cotton balls out without pulling little by little of the cotton ball? And, the amount of cotton...sheesh. thought having cotton in a pill bottle is dangerous, fibers break down ! I just keep the cotton in there just because I have a tendancy to drop the bottles a lot (butter fingers). As for the dessicant packets - I put them into my airtight water and fire resistant safe so the papers don't mold. Maybe they should just make smaller bottles (or fill them up more) so there's not so much empty space to begin with! I've always been bothered by that. p.s. be careful to not inject any of the fibers cos 'cotton fever' is awful. I use cotton in my metal portable pill box to keep the tiny pills from spilling as I open the box. I will stop using the cotton if it ruins the potency. Now I question the metal material for storing my medication. It could be that the drugs you have paid for have been replaced with sugar pills. A cotton ball indicates that the container has been tampered with.